We take restoring your precious heirlooms very seriously. From simple repair, ring sizing, prong retipping, soldering & clasp repair to pearl restringing and fine antique jewelry restoration. We are happy to assist with all your repair needs. Designing a custom piece of jewelry is one of the most enjoyable experiences a client can have at Bradley’s. We literally hand sketch your design right before your eyes! we also utilize computer aided design when needed. We transform your visions and dreams into practical, durable, daily-wear jewelry. We work in white gold, yellow gold and platinum. Selling family or personal jewelry can often be an emotional process. Let bradley’s make it a pleasant experience for you. We specialize in buying diamonds 1.00ct and up! 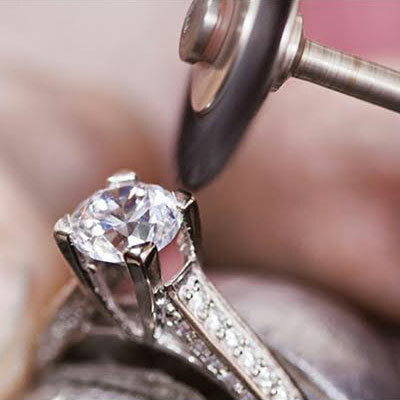 We offer both insurance appraisals and jewelry consultation services. We use our interactive state of the art gem lab to examine your jewelry and educate our clients. We help to navigate the complexities of settling jewelry estate matters. Bradley’s offers exceptional watch services. Specializing in Rolex and other fine Swiss brands. Includes 1 year full service warranty. We also replace watch batteries and remove links... in most cases while you wait! Along with exquisite jewelry we are proud to offer internationally renowned artists. Their use of playful color will transform any room into its own art gallery. Own a piece of history! from Alexander The Great and Julius Caesar to the Atocha. We specialize in Greek, Roman and Spanish coinage.